A dysfunctional writers’ group melts down when their newest member (Kaley Cuoco) finds overnight success. 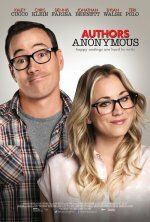 Authors Anonymous release date was Friday, April 18, 2014. This was a Limited in theaters release.